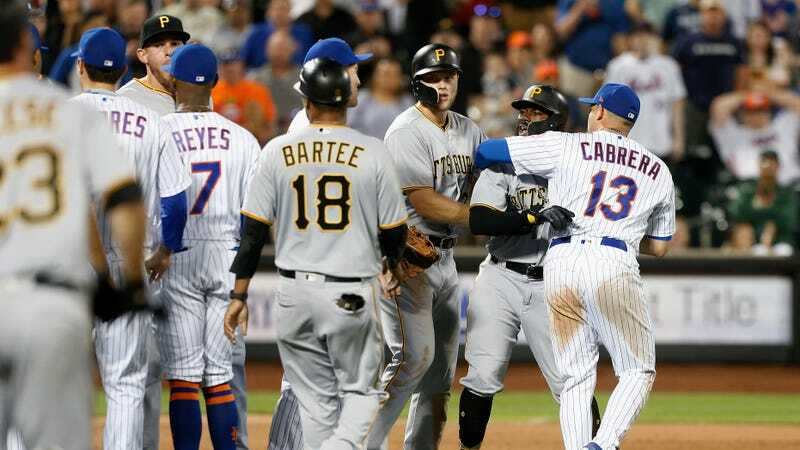 What happened between the Mets and Pirates in New York last night doesn’t qualify as a brawl or even a fracas, but it did constitute one of the silliest bench-clearings in recent memory. Harrison yapped back, which got both teams out of the dugout and both bullpens emptied, and led to a ridiculous scene in which Cabrera, the guy Familia was ostensibly sticking up for, was gently hugging Harrison in order to protect him from his rowdy Mets teammates. Between this and Hunter Strickland losing his mind over some harmless enthusiasm, it’s long past due for the angry baseball men to recalibrate their grump meters. There’s no need to live like this.